Quality issues impact end products, processes that produce them, overall corporate performance, customer satisfaction, controls, environment, morale, profitability and risk. 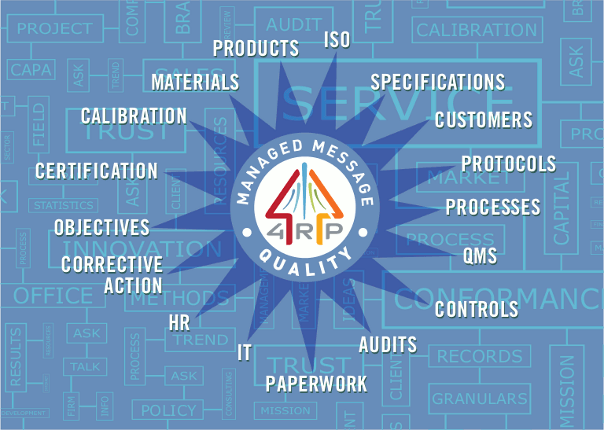 4RP quality messaging provides and facilitates quality testing on an ongoing basis using smaller subsets of USER quality issues. USER quality issues with compliance concerns are prioritized at a higher level and are checked more often without neglecting other more compliant issues. The overall message has to be “Quality” for all issues. In depth checks of fewer items lead to superior compliance of all the issues. People soon realize that all processes and compliance will be tested over time. New compliance issues can be set at a higher priority for more attention.